INDIAN CRAFTS are known for their traditional appeal. 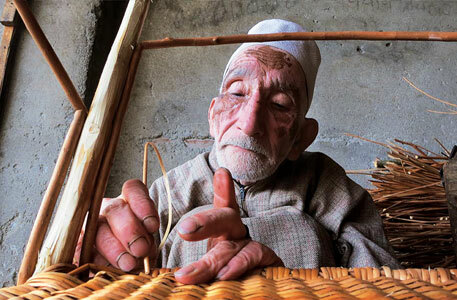 Be it pottery, puppetry, handloom, painting or weaving, each craft involves deep-seated knowledge and technique that has been handed down to artisans for generations. Sadly, many Indian crafts are now dying a slow death, thanks to industrialisation. What used to be produced by artisans with locally available raw material is now mass produced in factories, and profit-driven traders have overshadowed hardworking artisans, threatening generations of skill and wisdom. But there is a silver lining. While crafts may be experiencing decline, their demand is on the rise-many upper-class Indians want the traditional to adorn their modern homes. Entrepreneurs see this as a business opportunity. Startups are providing artisans an online platform to feature and sell their products while showcasing the lost glory of Indian craft. Spectrahut is one such venture. Husband and wife Ankit and Khushboo Sharma spent four months travelling and researching on Indian art and handicraft before launching their business in Meerut, Uttar Pradesh, in September 2013. “The idea was to create opportunities for women and underprivileged artists,” Khushboo says. Spectrahut was launched with Terracotta Diwali Collection, which, Ankit says, was a big risk. “We were apprehensive about starting an online shopping store with terracotta products which are breakable and difficult to transport. We had initially invested Rs 45,000,” says Ankit. The couple recovered approximately 35 per cent of this in less than three months. Spectrahut works with about 10 award-winning handicraft artisans from all over the country and also trains housewives around Meerut to make such traditional products. The online store has a vast range of hand-made artificial jewellery, accessories, home décor products and kitchenware. Prices start from as low as Rs 135. Hanging lamps and wooden spice boxes are the bestsellers. “I love the beautiful gel candles of Spectrahut, especially the scented candles for spa,” says Zeba Khan, a resident of Zakir Bagh, New Delhi. All products are produced at the artist’s place, from where they are purchased in bulk. Orders are dispatched after a quality check. The company gets 10-15 orders on an average every day; this goes up to 30-40 during the festive season. 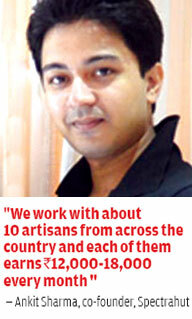 “Each artisan we work with earns Rs 12,000-Rs 18,000 monthly,” Ankit adds. While Spectrahut earned a profit of 25 per cent in its first year, it had a turnover of Rs 5 lakh in 2014. CraftCanvas in Ahmedabad, Gujarat, is a similar venture. Started by NishaVikram, CraftCanvas sells gifts, accessories, garments, jewellery, kitchenware and home décor items. While the price of accessories and jewellery range from Rs 599-Rs 899, Gond paintings and Pattachitra works cost a whopping Rs 4,000-Rs 24,000. What differentiates this initiative from Spectrahut is its customised craft murals. CraftCanvas aims at bridging the gap between the rural producer and urban consumer by taking traditional craft to city residents in the form of installations and decorative wall art. Spectrahut designs spaces in corporate offices and homes as well as public places. 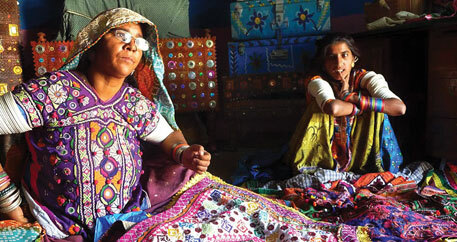 Since its inception, the company has employed over 200 artisans, on whom at least 60 per cent of the revenue is spent. “Our profit margin is not very high. It is a conscious decision to keep the margin around 10-15 per cent to expand the scope of our work. 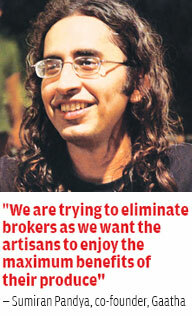 Customised craft is viewed as a highly elitist industry and we want to change that perception,” Vikram explains. CraftCanvas works with 20 communities of artisans across Andhra Pradesh, Bihar, Gujarat, Himachal Pradesh, Odisha and Rajasthan. 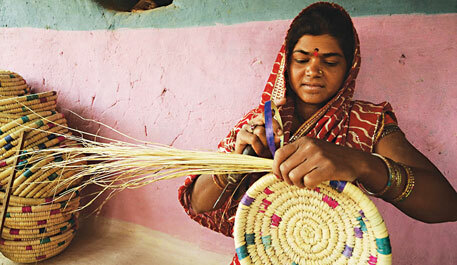 Team members visit villages to interact with artisans and understand their work and experience. They also organise workshops to train artisans on design drawings, colours and other techniques. Gaatha is another project promoting Indian art and craft. The e-portal was originally created to research and document Indian crafts that are experiencing decline. Since its formation in 2009, the founders of Gaatha have invested more than Rs 2 crore to develop their portal which serves as an online repository of various Indian craft. Last year, the team expanded their work to e-commerce. Gaatha has a wide inventory ranging from intricate pottery and expensive Pashmina shawls to simple items of daily use like ropes and kitchen- ware. It works with artisans in Gujarat, Madhya Pradesh, Rajasthan, Jammu and Kashmir and Odisha, where it holds sessions in villages to help artisans market their products. Does it really benefit artisans? While it is too early to say if the new trend is just a passing fad, artisans are not very confident. “We have been selling locally made products at a reasonable price for nearly 35 years. We have a slim profit margin, but we manage to recover our cost. Online websites sell our products at very high rates,” says Anju Ugrejiya, who sells traditional sarees, skirts and bags at the Gujarati lane near Janpath market in the capital. Besides, not everyone is a fan of traditional products sold online. “All these fancy websites seem to be minting money. I have bought the same products they sell for less than half the price from artisans in Jodhpur,” says Udyan Biswas, who loves street shopping. N C Joshi, director, Centre for Cultural Resources and Training, Dwarka, believes that such business ventures do not give local artisans their due. “There have been instances in the past when local artisans have been lured by businessmen who purchase their produce at a cheap rate and then sell the same at exhibitions for lakhs of rupees,” he adds. But some are hopeful. Ruchika Ghosh, chairperson of the National Handicrafts and Handlooms Museum, New Delhi, says that the Ministry of Textiles is trying to expand the market for local artisans through tie-ups with online shopping stores such as Flipkart. “I am apprehensive, but I hope this new marketing strategy works,” she adds.